Following on from the success of the Banbridge depot Bann Hire decided to open a second depot Based at Portadown to cover the increased demand for quality affordable plant hire. The Mahon Road depot opened its doors in 2009 and quickly established itself as the No1 rental solution in the Portadown area. Back in 2009 Northern Ireland was in the middle of a severe recession but Bann Hire seemed to buck the trend and continued to grow steadily and now provide its loyal customers with one of the youngest hire fleets in the industry comprising of powered access up to heights of 80ft, excavators 0.75 ton -21 ton, site dumpers from 1 ton – 10 tons. In 2013 Bann Hire cast its network further north opening its 3rd depot this time in Co Antrim. The Moira Road based depot had previously been a hire depot for many years but had lay idle for quite some time. Having seen a demand for its services from this area it seemed the right decision to venture into this next phase of its growth. Bann Hire now employ 18 members of staff and their sole aim is to provide a quality service at reasonable prices. Bann Hire don’t sell on price they just offer a service that’s priceless but affordable. At Bann Hire ‘what they promise is what they deliver and they sell the problem they solve, not the price it costs. At Bann Hire & Sales, our focus is the provision of top quality plant and equipment, delivered to site on time with a first class back up service. Please have a look through our new website and should you need any further assistance or product knowledge feel free to contact one of the team in your local area. Brendan is the manager of our Portadown depot. Brendan has worked in the hire industry since 1997 and has a wealth of experience in all areas of the hire industry. Brendan joined the Bann Hire team in 2009 and has made Bann Hire the number one rental choice for the people of Portadown and surrounding Armagh area. Over the past seven years the fleet has grown considerably and the heavy investment in new plant and machinery means that Bann Hire can delivery a fast and reliable service on time and as promised. 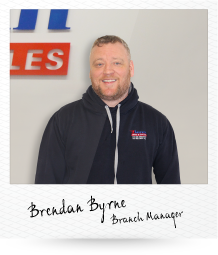 19 years is a long time in the hire industry and Brendan can use all this experience to ensure you have the right equipment for the right job right when you need it. For all your small tool, heavy plant, access requirements, powered access, power generation, gardening equipment call your local hire team. Martin has been at the forefront of the Lisburn depots success. Martin is the oldest member of the Bann Hire team but his enthusiasm and love for the job means his customers can always count on him to deliver as promised. 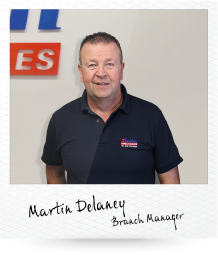 Martin has spent a life time in the Hire Industry holding every role at some point in his successful career from depot manager to area sales you can be guaranteed that Martin and the rest of the Lisburn team can help you find the perfect solution for your rental requirements. Bann Hire Lisburn has been trading for 4 years now and has established itself quite quickly as major player in the Co Antrim area. 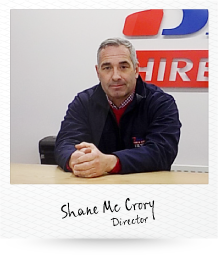 Shane is the founder of Bann Hire and has seen his vision for a reliable dependable hire company develop from small beginnings to the well established rental company of today. Breaking into the mid ulster and co antrim hire market wasn't easy but he knew that with hard work heavy investment and a can do attitude, customers would be won over with the Bann Hire level of service. Shane can call on 24 years of experience and has held every role in the industry and has built his success on always succeeding customer expectations and working hard to fulfil promises.